This name uses Spanish naming customs: the first or paternal family name is de Larrocha and the second or maternal family name is de la Calle. Alicia de Larrocha y de la Calle (23 May 1923 – 25 September 2009) was a Spanish pianist and composer. She was considered one of the great piano legends of the 20th century. Reuters called her "the greatest Spanish pianist in history", Time "one of the world's most outstanding pianists" and The Guardian "the leading Spanish pianist of her time". She won multiple Grammy Awards and a Prince of Asturias Award for the Arts. She is credited with bringing greater popularity to the compositions of Isaac Albéniz and Enrique Granados. In 1995, she became the first Spanish artist to win the UNESCO Prize. De Larrocha, writes Jed Distler, "started composing at age seven and continued on and off until her 30th year, with a prolific spurt in her late teens," and while she never performed her works in public, she gave her family the choice of making them available after her death, which they have done. De Larrocha made numerous recordings of the solo piano repertoire and in particular the works of composers of her native Spain. She is best known for her recordings of the music of Manuel de Falla, Enrique Granados, Federico Mompou, and Isaac Albéniz, as well as her 1967 recordings of Antonio Soler's keyboard sonatas. She recorded for Hispavox, CBS/Columbia/Epic, BMG/RCA and London/Decca, winning her first Grammy Award in 1975 and her last one in 1992, at the age of almost seventy. She received the Prince of Asturias Award for the Arts in 1994. Less than five feet tall and with small hands for a pianist, in her younger years she was nonetheless able to tackle all the big concertos (all five by Beethoven, Liszt's No. 1, Brahms's No. 2, Rachmaninoff's Nos. 2 and 3, both of Ravel's, Prokofiev's No. 3, those of Bliss and Khachaturian, and many more), as well as the wide spans demanded by the music of Granados, Albéniz and de Falla. She had a "long fifth finger" and a "wide stretch between thumb and index finger" which helped make her more technically gifted. As she grew older she began to play a different style of music; more Mozart and Beethoven were featured in her recitals and she became a regular guest at the "Mostly Mozart Festival" of the Lincoln Center for the Performing Arts in New York. In 2001, she was named Honorary Member of the Foundation for Iberian Music at The City University of New York. De Larrocha retired from public performance in October 2003, aged 80, following a 76-year career. Alicia de Larrocha died on 25 September 2009 in Quiron Hospital, Barcelona, aged 86. She had been in declining health since breaking her hip five years previously. Her husband, the pianist Juan Torra, with whom she had two children, died in 1982. 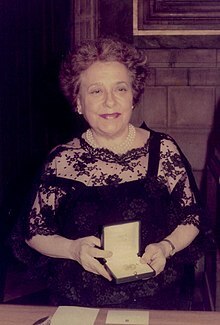 De Larrocha won several individual awards throughout her lifetime. Her extended discography has been recognized with 14 Grammy nominations (1967, 1971, 1974,1975 (X2), 1977 (X2), 1982 (X2), 1984, 1988, 1990, 1991, 1992) and she won four Grammy Awards. She received honorary degrees from universities in Michigan, Middlebury College, Vermont, and Carnegie Mellon. ^ a b c Webb, Jason (26 September 2009). "Renowned Spanish pianist de Larrocha dead at 86". Reuters. Retrieved 26 September 2009. ^ a b c d e f g h i "Alicia de Larrocha, Renowned Pianist, Dies at 86". Time. 26 September 2009. Archived from the original on 1 October 2009. Retrieved 26 September 2009. ^ a b c d e Adrian Jack (26 September 2009). "Alicia de Larrocha obituary". London: The Guardian. Retrieved 26 September 2009. ^ a b c "Pianist Alicia de Larrocha dies". CBC News. 26 September 2009. Retrieved 26 September 2009. ^ a b Allan Kozinn (26 September 2009). "Alicia de Larrocha, Pianist, Dies at 86". The New York Times. Retrieved 17 November 2016.